Aufderheide Scenic Highway – First Ride. 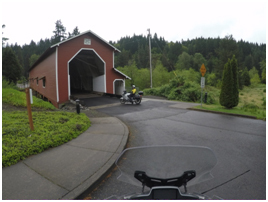 One of the many joys of living in Oregon is the seemingly numberless places to ride motorcycles. That said, we all have our favorite routes. 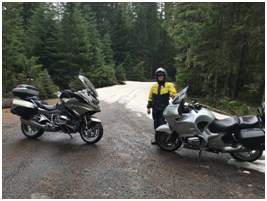 Some riders prefer the wide open spaces of Eastern Oregon, others prefer the greenery of Western Oregon. For me, well, I’ll take either one. One of my favorite rides is the Aufderheide Scenic Highway that runs from Westfir to Rainbow. I’m always amazed at the girth of 300 year old Douglas fir trees. 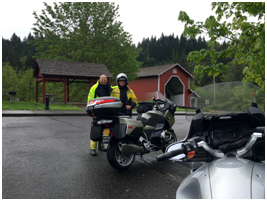 Doug Tewksbury waiting at Office Bridge in Westfir. It’s always a bit of a gamble on seasonal roads when it comes to riding conditions. One must be mentally prepared for whatever hazards the road may offer. For our day, the Aufderheide had more than a few hazards to offer. In Basic Rider Training, we spend about an hour teaching students to be aware of changes in road surface color and texture. Assume that any change is about to offer up a compromised traction surface. First and foremost was the color of the Aufderheide this time of year. I’ve been in a few bars where the felt on the pool table was less green! The road presented mile upon mile of color. No worries – we are taught to limit lean angle, avoid abrupt control inputs, and scrub off some speed. Of course, the later can often be hard to do! As the ride progressed, it wasn’t hard to see the debris that last winter's storms deposited on the roadway. Trees four foot in diameter, had be cleared from the roadway. Unfortunately, the crews wielding the chain saws left piles of tree cuttings in the road. No worries, keep the head and eyes up, and look through the turns for critical hazards. There is a saying, “every dollar has a friend”! Unfortunately, the Aufderheide doesn’t seem to have many friends when it comes to getting its’ fair share of road maintenance dollars. There are several points where the road narrows to one lane, plenty of potholes and pavement seams to keep even the most experienced riders “entertained”! Did we have a good time, in spite of it all? We sure did! Bob and Doug…. Lets go ride!